How Raven stole the sun and placed it in the sky. Raven, in Northwestern Coastal mythology, is the Trickster, the agent of mischief and games. Raven was covetous of the sun but couldn't figure out how to steal it. He finally found a way and when you hear him call, he's still laughing about how clever he was. This photo courtesy of John Fletcher and the Museum of the American Indian. You can listen to any show again. Search here. Become a BirdNote benefactor! Thanks! Raven, in Northwest Coast native mythology, is the equivalent of Coyote in the Southwest—a trickster, an agent of mischief and games. One creation myth is the story of how the sun came to be in the sky. The Chief of the People had a bent-wood box in which he kept the sun. Raven was very covetous of the sun but couldn't figure out a way to gain access to the longhouse and steal it. Finally he devised a plan. He turned himself into a fir needle. One day, the chief's daughter was taking a walk in the forest. Raven — as the fir needle — dropped into her drinking cup and she swallowed him. Shortly thereafter she became pregnant and gave birth to a healthy baby boy. When the boy was strong enough, he opened the box, took out the sun, ran outside, and turned back into Raven. Flying up into the sky, he placed the sun there so that all could see it. 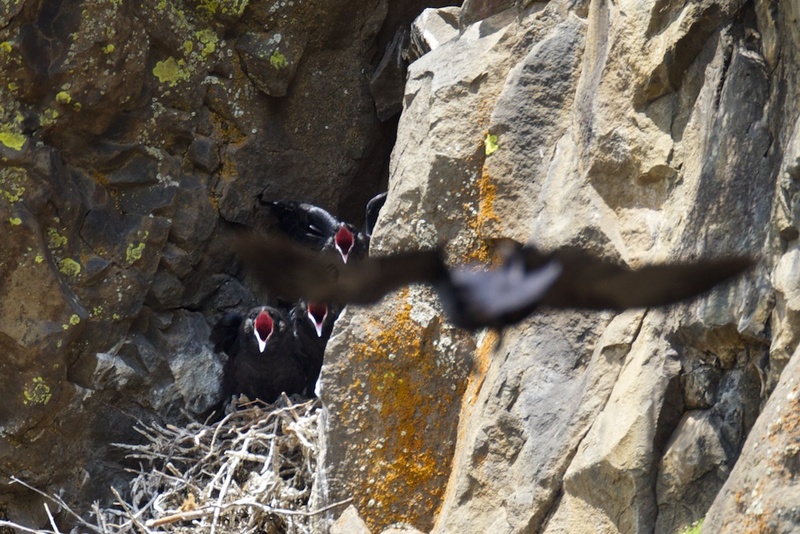 See a picture of Raven – and also sign up for the podcast and weekly preview email – on our website, BirdNote.org. I’m Mary McCann. Some Common Raven sounds provided by The Macaulay Library of Natural Sounds at the Cornell Lab of Ornithology, Ithaca, New York. Call recorded by G.A. Keller. Flight sounds recorded by D.R. Gunn. Featured raven and ambient forest recordings by Chris Peterson. Become a BirdNote supporter. Thanks! 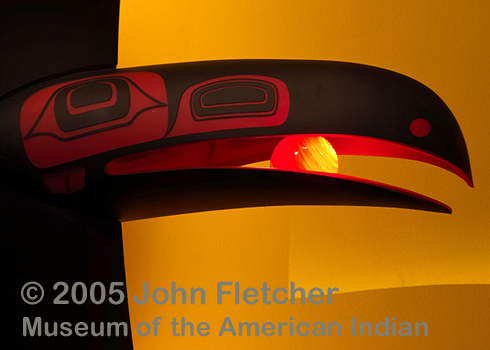 Museum of the American Indian - Learn more!